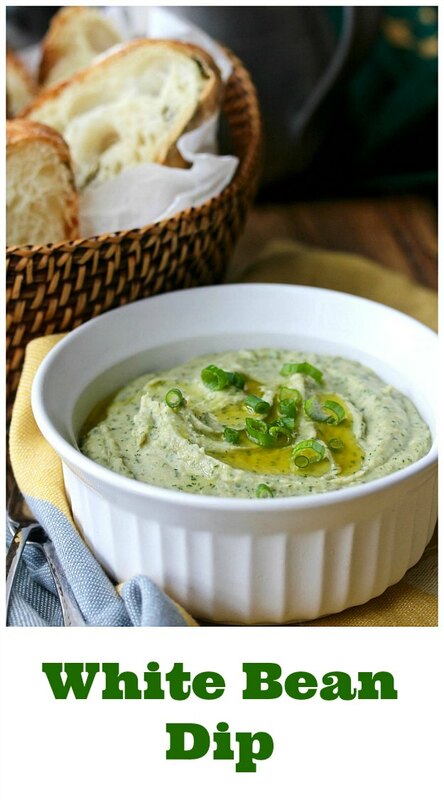 This White Bean Dip with Herbs is a great appetizer to whip up when you're expecting last minute guests. It's fabulous spread on bread, pita chips, or crackers. This dip is simple to make, and can be thrown together with ingredients you probably have in your pantry and refrigerator. While I used dill, mint, and parsley for the herbs, you could substitute any herbs you have on hand. 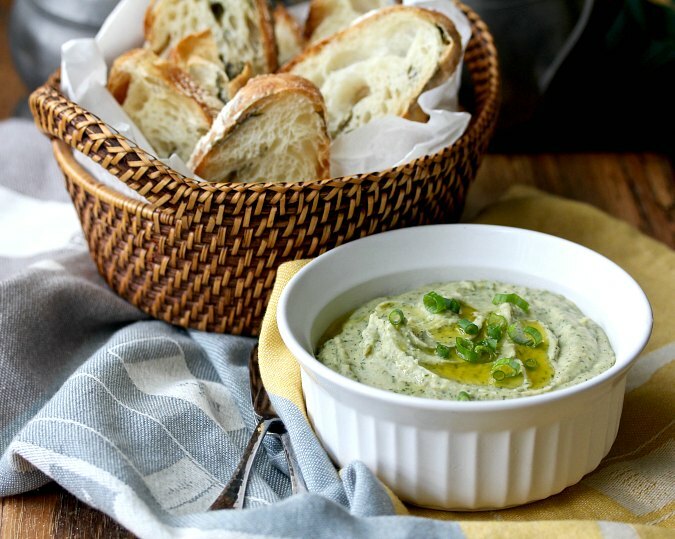 This white bean dip is inspired by the section of the book Mark Bittman's Kitchen Matrix: More than 700 Simple Recipes and Techniques to Mix and Match for Endless Possibilities. Over 700 recipes in 300 pages! The section is called Finger Foods +Recipe Generator. The Recipe Generator sections of the book don't have recipes per se. Instead, they include lists of ingredients you can combine. For example, this section lists 6 bases (such as bread, pita chips, etc. ), spreads (such as hummus, cream cheese, etc. ), and toppings (such as smoked salmon, pickles, capers, etc.). 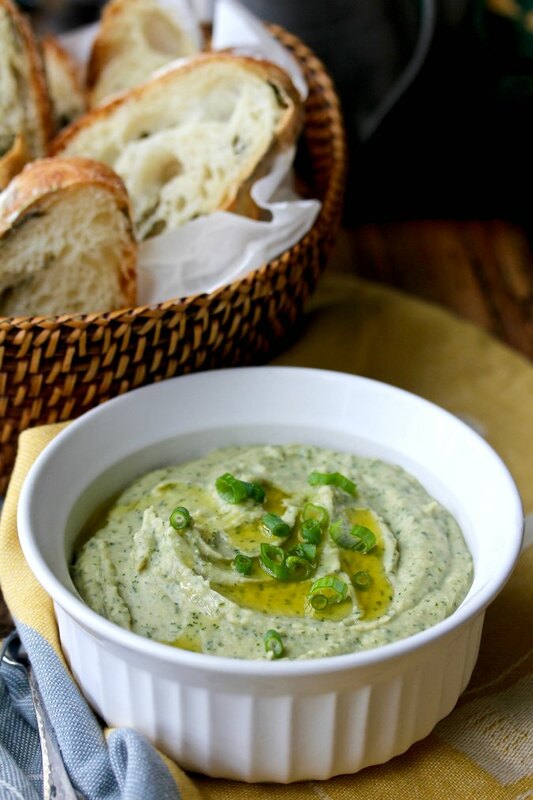 I thought this white bean dip would be wonderful for an impromptu appetizer. Set it out with some bread or pita chips along with some olives and some celery sticks or a veggie plate, and you're covered. I served this dip with slices of garlic and kale ciabatta (to be posted soon!). 1 (15 ounce) can white beans, such as cannellini, drained, 1/4 cup of the liquid reserved. In the bowl of a food processor or blender, add the beans and the 1/4 cup liquid. Add the garlic, dill, mint, parsley, olive oil, lemon juice, salt, and cayenne powder and pulse until smooth. Taste and add additional salt. Spread the mixture into a serving bowl and drizzle with additional olive oil. Sprinkle with the scallions and/or additional herbs. I'm spending a year cooking through sections of the book with Wendy of A Day in the Life on The Farm and Camilla of Culinary Adventures with Camilla. Here are their takes on Finger Foods. I love bean dip. I was so glad to have an easy theme after last month!! I can't wait to make this!! Thanks for sharing, Karen. Thanks Cam. It's pretty tasty if I say so myself! Amazing! Definitely making this. Please do try this as a side for smoked fish. The combo is so good!